Complete your PADI Instructor Development Course (IDC) with the experienced team at Sugar Land Dive Center. Whether you are in Houston, Katy, Pearland or out of the local area we have you covered as you continue your path to becoming a PADI Scuba Instructor. Our promise to you is simple. If you complete your IDC with Sugar Land Dive Center, we guarantee you will pass your IE or you can come back and participate in another IDC at no additional cost. We will even include your additional PADI fees! 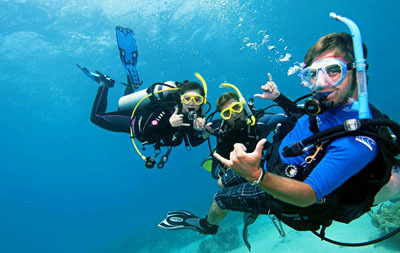 Check out our "Why Choose Sugar Land Dive Center" page for many reasons to choose us for all your professional training. Your PADI IDC is made up of two parts - the Assistant Instructor (AI) course and the Open Water Scuba Instructor (OWSI) program. Most dive professionals will complete the entire IDC and then attend a PADI Instructor Examination (IE) which is the final step to earn your PADI Instructor Certification. At Sugar land Dive Center we believe it is most beneficial to complete your PADI Instructor Development Class in one contiguous block of time, though we realize that job or life schedules don't always allow this. That is why all our IDC's have weekend and weeknight schedules. 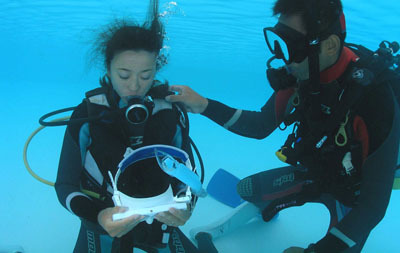 Weeknight and Weekend Options available for all our PADI IDC's. Call us for scheduling options. With our training experience, we have found the most challenging aspects of the Instructor Exam (IE) are the Dive Theory Exams. The IDC Prep course is designed to give the IDC candidate extra dive theory exam preparation to ensure their success on the Instructor Exam. During a typical IDC, there is little time to review these topics. The Sugar Land Dive Center IDC Prep Course reviews these topics and identifies any areas of weakness that need strengthening. This is why our IDC Prep Course is included with all of our IDCs. IDC's scheduled to end on Cozumel will start at Sugar Land Dive Center. You will complete the academic and confined water potrions of your IDC locally and complete the Open Water Training portions on Cozumel. R/T airfare is not included. Not sure if you are ready to become a PADI Instructor, then take the first step and become an Assistant Instructor. Some of the comments and feedback we've had about the service and the courses that we offer.